First published by the Sowetan on 2 June 2016. We often hear about South Africa’s dismal education outcomes and low literacy rates. We have also been hearing that early literacy, reading for joy, and growing up around books can change the life trajectories of individuals and dramatically improve our society. Yet we hear much less about the actions that ordinary South Africans are taking today – large and small – to turn that around. Artists Neo Mathetsa and Caswell Mangaliso Mthathi were organising drama performances with children in their Mohlakeng neighborhood when they realised the kids had a big problem: they were struggling to read. So they went door-to-door in their township community, asking for book donations. They collected close to 2000 books and began stocking a library in a small building behind Neo’s house. Dubbed “The Underground Library” by community members, today children come after school to do homework, play games and rehearse performances. The library also lends books to adults, and volunteers follow up door-to-door to see whether people are reading and enjoying the books they’ve borrowed. John Nicholson, a pastor who lives in Lavender Hill, also has a library in his backyard. Since it opened in 2005, it’s grown from 22 books to a few thousand. “I used to spend a lot of time with my sons, and read to them,” says John. “And then I said to myself, if I can do this for my two children, I could do this for somebody else’s. That’s the motto of our project: ‘Your child is also my child.’” Before Breadline Africa donated a library container, he’d spread blankets on the ground in his yard and invite kids to share stories. His project has also grown: on weekday afternoons, children arrive in his converted garage and greet “Uncle John” before they settle in to read stories, do puzzles, play games and do homework. John, Caswell and Neo have gone the extra mile. But helping children learn to love to read isn’t rocket science – and being a literacy activist doesn’t have to mean opening a library in your backyard. There is a growing consensus that growing a culture of reading would be a game-changer to tackle poor learning outcomes, poverty and inequality. And there are small, simple things that each one of us can do to help children reach their potential. Being a literacy activist can simply mean visiting a school on World Read Aloud Day to bring a story to life for children; donating snacks to a local reading club or reading programme; talking to other parents about the benefits of reading aloud; asking friends and family to donate books in lieu of birthday gifts; or gathering grandchildren around to tell stories after dinner. I didn’t see it then, but my mom was a literacy activist. She took me to get my first library card at the age of three, when I could hardly sign my name. Even once I’d learned to read, we still gathered every night in my sister’s bed to listen to stories. My neighbor Michelle was a literacy activist, too. She was five years older than me, and one day, she suggested that we could make our own library. That autumn, she came over every day after school to fold and staple paper, invent titles and brainstorm storylines with us. 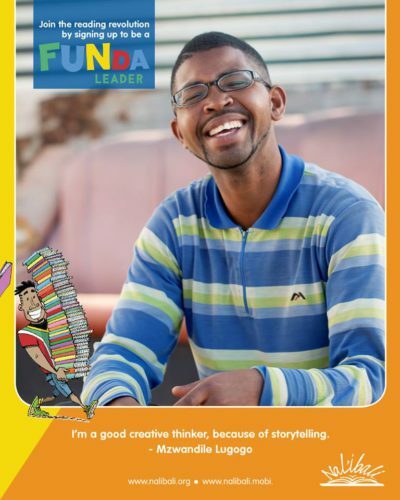 This Children’s Day, Nal’ibali, the national reading for enjoyment campaign, is launching a call to all South Africans to join the movement of “FUNDA Leaders” – adults who want to help get South Africa reading. The campaign is offering practical ideas, advice, resources, support and training to anyone who is ready to start changing lives through words and stories. Each one of us has the power to change a life. And an army of adults standing up for reading has the potential to rewrite our collective story. Join Nal’ibali and become a Funda Leader here. If you need even more inspiration watch this!